MsgFiler is a powerful filing application for Apple Mail. MsgFiler’s fast searching means you just have to type a few characters to find the right mailbox. Move selected messages with a press or open a mailbox without having to navigate the mailbox folder pane. 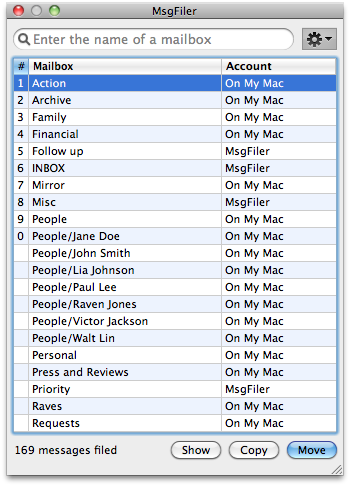 MsgFiler is optimized for keyboard-only usage, perfect for Apple Mail power users. What would you do with extra minutes in the day? Hours in a week? MsgFiler saves you time when organizing your Mail messages. Say bye-bye to sore wrists and mouse shoulder! Using MsgFiler to file your messages is much faster than dragging and dropping. Let your fingers do the filing. Simply type a few letters of the mailbox you wish to files your messages to, and MsgFiler will show it to you instantly. MsgFiler works with Mail to provide a one-stop source for organizing your messages and mailboxes. While MsgFiler is now an application, it behaves in very much the same way as the old MsgFiler Mail Plugin.